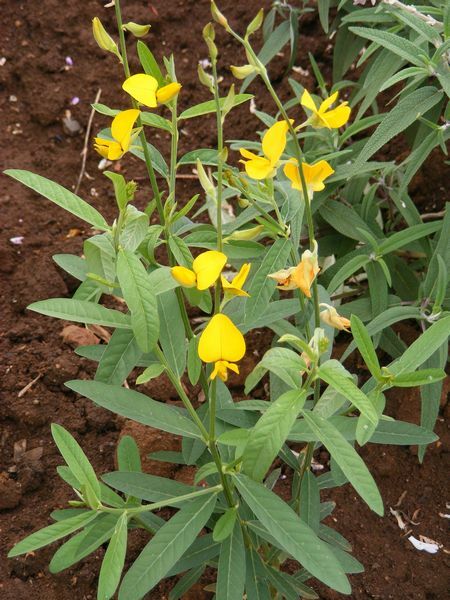 Sunn hemp is a fast growing legume which originated in India and Pakistan. It is an erect, herbaceous, laxly branched annual shrub growing up to 1.5m high, with bright green, simple elliptical leaves. 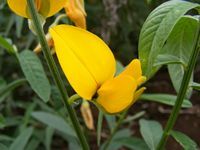 It bears deep-yellow terminal flowers that turn into small, inflated light brown pods. The seeds are heart-shaped, grayish olive, dark grey or dark brown to black and loosened in the pod at maturity. It has a well-developed root system, with a strong taproot. Sunn hemp is grown in temperate regions as a summer annual. Although it can tolerate light frost, growth and nitrogen fixation are reduced under cool conditions. Sunn hemp is drought tolerant and can grow in hot, semi-arid and arid areas with an average annual rainfall as low as 200 mm - but irrigation is necessary for maximum growth and nitrogen fixation. It is adapted to a wide range of soils and performs better on poor sandy soils than most other crops. However, it grows best on well-drained soils with a pH from 5.0 to 7.5. Sunn hemp can be planted for production of bast fibers used in the manufacturing of twine and cord, high quality paper and pulp. For fiber, it grows best on fairly light textured soil like sandy loam or loam of at least moderate fertility. For other purposes, it will also grow well on clay soils and will tolerate low fertility providing that soils are well-drained. 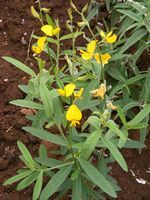 Sunn hemp can be planted as a cover crop and green manure to improve and rejuvenate soil quality. It is excellent to add nitrogen and carbon, for increasing soil organic matter to over-farmed soils, for loosening subsoil, to reduce soil erosion, conserve soil water and recycle plant nutrients. To do this, Sunn hemp need to be plow down before reaching full-bloom stage otherwise it becomes too fibrous. Sunn hemp is known to suppress nematodes and can be planted as a break crop to reduce weed and nematode populations. It produces a compound that is toxic to several nematode species, making it an excellent weapon for pest management and to control root-knot. Sunn hemp can be grown as livestock feed - it is non-toxic to animals. When grown for forage, it can be harvested, starting 6 - 8 weeks after sowing, and then every 4 weeks.